Here is the loom I’m offering for my Intro to Tapestry Weaving at Yarn Okanagan in Kelowna on Saturday June 1st. It’s 15”X20” and only $35 which is included in the workshop fee. Students also get a $40 discount on a Mirrix Loom if they wish. I’ll have a large stock of Mirrix Looms with me, from the 12” to the 38” for my students to drool over. 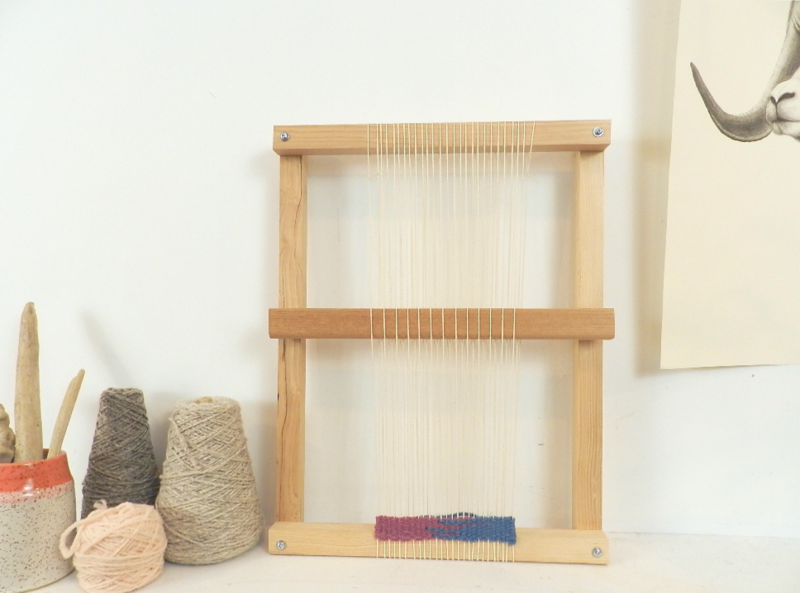 Over the years I’ve designed various wooden frame looms to offer my students in beginner tapestry weaving workshops. They have varied somewhat in size and function, but I think I’ve finally settled on this one. Looks like every other frame loom you’ve seen, right? Well, its simplicity is what I love about it. I always keep versatility and cost in mind when I’m offering workshop looms, as I never want my students to feel as if they need to invest too much. Why no notches, you ask? You’re right - many other wooden frame looms are fashioned with notches for the warp yarn to fit through while you dress the loom. They offer even spacing from the get go. But I have a couple of issues with them. One is that those notches only keep your warp yarn evenly spaced for the first few rows of weaving. After that it’s up to you as the weaver to maintain even weft tension, lest your warp yarns become too close together or too far apart. My second issue is that once they are there your loom is set to that warp spacing, also known as ends-per-inch (EPI), and you can not use your loom with weft yarn that is much finer or much thicker than that loom is built for, or move your warp yarns to the exact EPI you wish. So, you kind of throw versatility out the window for the sake of saving a couple of minutes of spacing yarn by hand each time you begin a weaving. Will I be seeing you at Yarn Okanagan? After teaching my morning tapestry workshop I’ll be in my Everlea Yarn booth in the Marketplace at the historic Laurel Packing House. See you there! PS When you buy a Mirrix from me you get an exclusive link to a 20 minute video where I show you how to unbox, warp and heddle your Mirrix Loom. Also, don’t forget that if you’re a past tapestry weaving student of mine you still get a $40 discount on your first Mirrix Loom. Reach out any time and ask me about it.